Since 2012, 11 October has been marked by the United Nations as the International Day of the Girl. 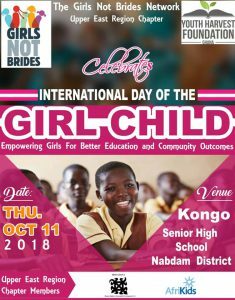 The day aims to highlight and address the needs and challenges girls face, while promoting girls’ empowerment and the fulfillment of their human rights. The YHFG has several projects to address the needs and challenges girls face such as the remedial school. sexual and reproductive health education and the youth center (read more).